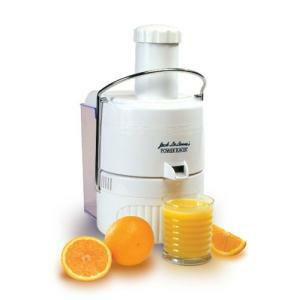 The Jack La Lanne Power Juicer's 3600 rpm induction motor comes with a lifetime warranty. For all that power, the operation is incredibly quiet. This machine features a surgical quality stainless steel blade, an extra large round feed tube (with a three inch interior diameter), a super sized pulp collector, and automatic pulp ejection. The collector detaches for convenient removal of pulp and for cleaning. The unit has dishwasher safe parts. This model provides thirty percent more juice than regular juicers through a patented extraction technology. The juicer has a number of safety features included and comes with a recipe/instruction booklet. People find that certain harder vegetables can tax the machine. A number of people have experienced motor problems and breakage of plastic parts. The response to this product seems to be equally mixed, with many claiming the unit is as quiet as it is advertised to be and that it does produce high quality juice and exceptionally dry pulp. The official site for the Jack La Lanne juicer does have a number of helpful guidelines, addresses many common questions, and offers replacement parts if needed. When you do your own juicing, you can create your own blend of fruits and/or vegetables. Make juice to suit your preference. You can also choose your own produce for juicing and be assured that your juice will be free of preservatives, sugar, artificial flavors, and colors. You can use organic produce for an even healthier juice product. Juice provides needed vitamins and enzymes and the pulp can be stored for later use. Compare this model with the Hamilton Beach Juice Extractor.